March 26, 2019: Premium Italian watch brand, D1 Milano have announced the launch of their new collection at Basel World 2019. Popular for its trendy and lightweight design the five-year-old brand, is now adding a chronograph range to its wide array of selection along with several new additions to their existing Polycarbon and Ultra Thin lines. The 26 young and dynamic CEO of the brand, Dario Spallone will be revealing the new chronograph collection at the upcoming Baselworld 2019 exhibiton. After an extensive and meticulous research, the chronograph range is curated to match the level of precision and detailing D1 Milano is known for. The stainless-steel case is 41.5mm in diameter and is 11 mm slim. The three sub-dials are presented with a soleil finishing and in colors that required months of design development. With a complete stainless steel built, the chronograph features a brushed bezel, case back and bracelet with the indices and hands in sandblasted brass finishing. The steel bracelet is also configured with a butterfly clasp. The new chronograph is powered with the innovative Seiko Meca-Quartz movement, combining the mechanical complexity of a flyback chrono module and accuracy of a quartz movement. 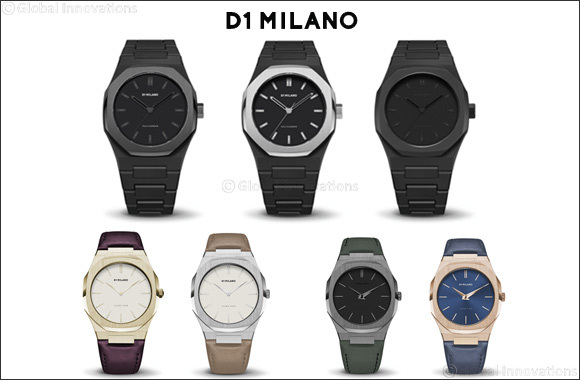 In 2019, D1 Milano is also updating the style of its iconic Polycarbon models, a line of unisex watches known for its lightness and durability. Composed primarily of Polycarbonate, the durable and trendy watches are perfect accessories to be worn during sport activities. D1 Milano focused on reinventing its bestseller timepieces while upgrading its aesthetics to meet essential quality standards. After an extensive research for a year, the new Polycarbon collection boasts new components that improve its durability without compromising accuracy or its water-resistant feature. The case is now only 8.8mm thick while maintaining the 40mm case diameter. Both the case and bracelet are crafted out of improved soft touch polycarbonate to enhance durability and the crown, bezel and case back are in black PVD stainless steel. Another improvement made to the Polycarbon are the new hands which also feature the Black Super-Luminova. The Black Super-Luminova guarantees visibility in poor lighting and is paired with the new gunmetal bezel version that exudes sportiness, making it a successful piece amongst the fan base. For women, D1 Milano keeps the metal bracelet intact while adds more colored suede leather straps and natural leather variant. Another major update to the women Ultra-Thin collection is in the face of the watch: The dial in all models have an eggshell color paired with thinner and more elegant hands, making the model an all-time favourite. Apart from the latest updates, D1Milano’s 2019 proposal include news about the other collections which is again divided into continuous, seasonal and limited edition. All the five collections offer a wide range of selection that perfectly suits everyone’s personality.